• Event delta: the accuracy for spotting state events. This option can only be selected if a model contains state events. • Integration Methods: 8 numerical integration methods are available, each with its own parameters. The parameters can be changed by clicking the Set Properties button or selecting the tab on top of the editor. • Output After Each: This is the plot interval. Use this option to generate output only after each equidistant time interval has passed. For each interval, the exact simulation point is used (if available) or the nearest point is used (if not available, for example when using variable step algorithms). • BreakPoints: Click this button to open the Breakpoints Editor. • General Properties: Click this button to open the General Properties Editor. • Endless: Select this option if you do not want the simulation to stop. 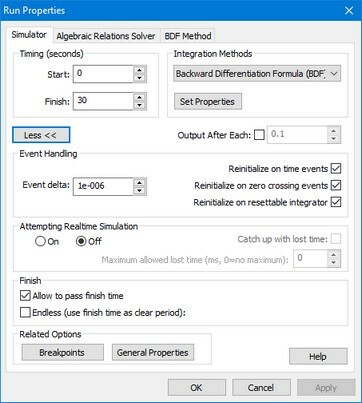 • Attempting Real-Time simulation: Select this option if you want the simulation to run as fast as the real time. You can choose the option Catch up with lost time and set the Maximum allowed lost time. • Use Attempting Real-Time simulation when you have keyboard input or joystick input in your model.